Liz Boardman met with Ann Dawson, managing director of the company’s UK tanker division to find out more about the integration of TDG and its plans for the future. With around 30 fuel bases across the UK, stretching from Inverness to Plymouth and everywhere in between, Norbert Dentressangle is well placed to serve companies such as Murco and Tesco, who have been customers for more than twenty years. At present, the company does not undertake any contracts for distributors, but would be keen to develop this area of the business. 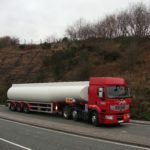 The company currently operates a fleet of nearly 200 fuel tankers in the UK, which includes its customers’ vehicles. As part of the move from TDG, the company is undertaking an aggressive replacement plan. By the end of 2013, at least 40% of the company’s vehicles will be sporting the distinctive red and white Norbert Dentressangle livery. “All new equipment is branded up as Norbert Dentressangle but existing equipment will only be rebranded when it is replaced,” explained Ann. Tankers are regularly replaced on a rolling basis, in line with the Group’s procurement strategy. The Group has an agreement in place with Renault but has also used MAN and Magyar on occasion. With 395 drivers working in fuels alone, health and safety is top priority for the firm. Norbert Dentressangle also employs a large number of multi-skilled drivers who work across various areas of the business. Depending on customer requirements, drivers will move from areas such as powder to gas or chemicals to fuels etc, and must all be highly trained. With a steadily growing workforce, investing in people is also key for Norbert Dentressangle. “We’re very lucky to have a stable management team, with a wealth of industry experience. We may not be the sexiest industry but we are attracting a lot of young people to the company. We operate a good graduate recruitment scheme and are actively recruiting now.” And it’s not just graduates. The company recruits at all levels including school leavers and is always on the lookout for fresh, keen individuals.